It has been a little over a year since I crushed the end of my right thumb in a log splitter. Like most household accidents this one was precipitated by doing something I shouldn't have been doing and thinking I would only do it this once. Yeah... umm... right. Needless to say my great idea ended up as a Saturday afternoon in the emergency room with a thumb full of pain and about 25% less muscle tissue. I can't even begin to describe the pain for you. It was intense, searing, crushing... did I say intense? But, as I look back on it all, the one thing the pain in my thumb brought to me the most was... focus. 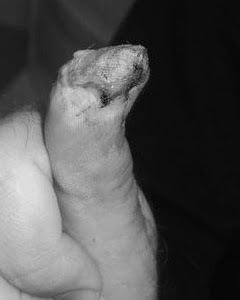 When I removed my thumb from the logsplitter, pulled the glove off my hand, and a piece of meat that could choke a cat fell out, it was as if every part of my body came together in perfect unison. There was a clarity of thought and a sharpening of focus like none I had ever experienced before. There was one goal and one mission; every fiber of my being was totally committed to this one purpose... to alleviate the suffering of this one tiny member... my thumb. A crushed thumb has the ability to proclaim the body is one and when one member suffers, all suffer. It's too bad most Christians don't get that about the Church. Think about it... All of us who call ourselves Christian are brought into, and made to be members of, one body. And I don't mean in a way like we all just joined the same softball team or have memberships at the local fitness center. We have been divinely and supernaturally united together by One Spirit. That truth has some implications behind it and it is worthy of some consideration and meditation.